Double Double Bonus is the most outlandish variant of the Bonus Poker genre, offering perhaps the most unique payout structure of any online video poker game. Let us show you how and where to play real money Double Double Bonus on the Web, as well as how it stands up against other styles in terms of house edge and theoretical returns. All of the above are trusted, secure sites that offer top-notch online video poker for Australians. Our number one Internet casino is Royal Vegas, which carries more than 500 real cash Microgaming releases in total – including more than 20 distinct varieties of electronic poker. And if you sign up today, you can claim up to AUD $1200 free on your first deposit. Click here to register for real money rewards at Royal Vegas Casino. 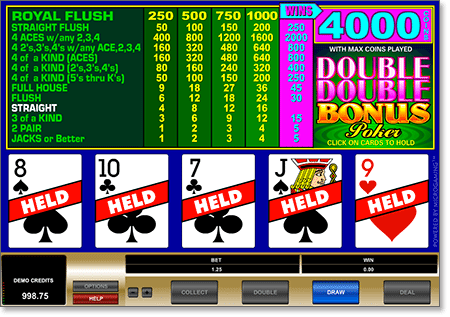 Double Double Bonus works like most other video poker styles. You bet up to five coins per turn and receive five cards from a standard deck of 52. With the aim of forming the strongest possible poker hand, you then choose which cards to hold and discard the rest for fresh ones. If you’ve hit a paying hand, the size of your win is determined by the preset payout chart on the screen (or the casing, with some land-based video poker machines). If you’ve got anything less than a pair of Jacks, you don’t get a dime. Always bet five coins per turn. There is a big bonus on the royal flush when you bet the maximum number of coins, which greatly reduces the house edge. Besides the Jacks-and-up rule and the four of a kind bonuses, rankings don’t count for much. A pair of Nines might look nicer than a pair of Threes, but its still worth nothing on its own. When you hit a winner, some versions will offer you the chance to gamble your takings on a double-or-nothing bet. This wager carries no house edge whatsoever, so there is no harm in taking the gambit – especially on minor payouts. Pokies Game Australia’s top-ranked Web casinos offer Double Double Bonus for both Windows PC and Apple Mac, alongside dozens more interactive video poker games by Microgaming – the world’s leading online gaming developer. Each of these trusted real money gambling sites caters for the Australian dollar, and each runs an advanced SSL (Secure Socket Layer) encryption to ensure that AUD deposits and withdrawals are 100 per cent protected. As you can see, there is a significant pay-rise (160 for 1) for landing four Aces – and an even bigger one (400 for 1) if your spare card is a Deuce, a Three, or a Four. Meanwhile, if you hit a four of a kind in Fives through Kings, you get paid a comparatively measly 50 for 1. So how do these special payouts affect the house edge in Double Double Bonus? Well, the easiest way to answer that is to see how this AUD video poker format stacks up against the rest – namely, its siblings in the Bonus Poker family. The payouts and percentages below are all based on the popular Microgaming versions found at www.RoyalVegasCasino.com. So despite the promise of bigger returns, Double Double Bonus poker actually has the highest house edge of the lot. There are two key reasons for this. Firstly, the bonus payouts on the four of a kinds improve the odds for us only slightly, given the probability of hitting those specific high-paying hands is very slim. Secondly, the two pair only pays one coin per win, whereas it pays 2 for 1 in Jacks or Better – and this has a far greater effect on the house edge, as it is a much, much more common hand to draw. So for all the potential rewards that come with chasing the Aces, the decreased payout on the humble two pair all but cancels out any long-term advantage. Below is a standard cheat sheet outlining the correct strategic plays in Double Double Bonus. When faced with multiple possibilities on your initial hand, always choose the highest-ranked option on the list.